West Virginia U.S. Senator Shelley Moore Capito returns this week as the guest speaker for the Mason County GOP’s Lincoln Day Dinner. Pictured is Capito speaking at the dinner in 2017. 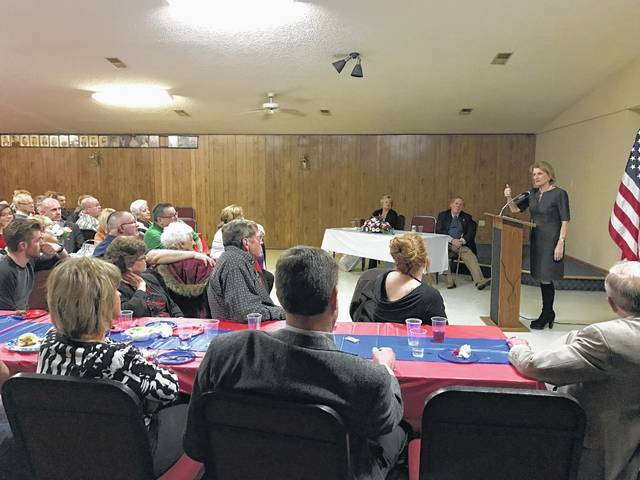 POINT PLEASANT — The first female elected to represent West Virginia in the U.S. Senate will be returning to Mason County this weekend to attend the annual Lincoln Day Dinner. The special guest speaker for the evening will be U.S. Senator Shelley Moore Capito (R), who gave the keynote address at the dinner in 2017. The dinner is set for Saturday, March 23, 6:30 p.m. at the American Legion in Point Pleasant and is hosted by members of the Republican Executive Committee and the Republican Women’s Group. Doors open at 6 p.m. and tickets cost $10 each at the door. Dinner is included with the price of the ticket. After representing the West Virginia’s Second Congressional District in the U.S. House for 14 years, 2001-2015, Capito became the first female elected to represent West Virginia in the U.S. Senate in 2014. She won all 55 counties and received over 62 percent of the vote. Capito regularly travels the state just as she did in her House district. In Washington, she is known by supporters as “a fierce advocate for the needs of the mountain state and fights to improve the lives of West Virginians.” In the five years since she was elected to the Senate, she has reportedly supported legislation to improve cancer survival rates among children, combating the growing crisis of women’s deaths related to pregnancy and childbirth complications, ending Alzheimer’s disease, and investing in research to explore innovative treatments and cures for diseases. As a member of the Senate Appropriations Committee, Capito has reportedly helped increase West Virginia’s share of federal funding to treat those suffering from opioid addiction and secured investment to bring jobs to the state’s distressed communities. She is the chair of the Appropriations Subcommittee on Homeland Security where she oversees funding for the entire department including Customs and Border Protection, Immigration and Customs Enforcement, and the Coast Guard. Capito is a member of the Senate Environment and Public Works Committee and also serves as the chair of the Subcommittee on Transportation and Infrastructure. From her seat on the Senate Commerce Committee, she has worked to increase broadband access for West Virginians. Though Capito was born and raised in Glen Dale, she resides in Charleston with her husband, Charles L. Capito Jr. The couple has three children and six grandchildren. She holds a B.S. in Zoology from Duke University and a M. Ed. from the University of Virginia. Some biographical information for this article provided by the office of Sen. Capito.